traps energy from the sun in the form of light. chlorophyll gives plants their green color. sustaining the life processes of all plants. photosynthesis is the source of our life as well. The functions of chlorophyll were discovered in 1913 by Dr. Richard Willstatter, a German chemist. He found that the chlorophyll molecule bears a striking resemblance to hemoglobin, the red pigment in human blood. Except for the central atom of the molecule, chlorophyll has an amazingly similar atomic structure. The central atom of hemoglobin is iron; whereas, the centerpiece of a chlorophyll molecule is a single atom of magnesium. Due to this similarity, chlorophyll provides most of the raw ingredients required to make healthy, vibrant red blood cells in the human body. 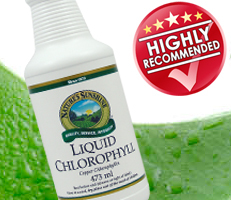 Chlorophyll is absolutely necessary for the health of plants, but it is also extremely beneficial to the human body. Chlorophyll is a rich source of magnesium, an essential mineral required for a variety of functions, including maintaining healthy bones, ensuring proper energy levels, supporting the body’s immune response and promoting circulatory health. It offers detoxifying and deodorizing properties as well. One of the principal benefits of chlorophyll is its ability to balance the body’s pH levels. which can subsequently pose risks for the structural system. Enzyme activity, hormone balance, weight management and other bodily functions depend on the body to maintain ideal pH balance. Adding Liquid Chlorophyll and other alkalizing foods to the diet can help balance an acidic environment. Chlorophyll benefits more than just plants. This phenomenal substance promotes the health of myriad body systems and helps maintain a balanced pH level in the body. Nature’s Sunshine’s Liquid Chlorophyll offers the power of the sun to keep you feeling healthy and full of energy.